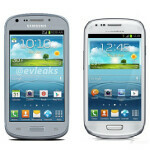 Samsung Galaxy S III mini heads to the states as the Samsung Galaxy Axiom for U.S. Cellular? Back last month, we noted how the Samsung Galaxy S III mini had kept an appointment with the FCC. At the time, we figured that the visit might stir up talk of a stateside version of the phone. Now,a tweet from serial leaker evleaks shows a new phone called the Samsung Galaxy Axiom and not only does the device resemble the Samsung Galaxy S III mini, the specs are similar. Mind you, it is not a perfect match, but close enough to give ourselves a pat on the back for being so prescient. According to evleaks, the Samsung Galaxy Axiom (SCH-R830) will offer a 4 inch WVGA display, similar to the Samsung Galaxy S III mini. The processor on the Samsung Galaxy Axiom is a dual-core 1.2GHz Qualcomm Snapdragon S4 versus a dual-core 1GHz NovaThor processor on the Samsung Galaxy S III mini. Both models are equipped with 1GB of RAM and a 5MP rear-facing camera. The tweet suggests that the Samsung Galaxy Axiom will have a 1.3MP front-facing shooter vs, the .3MP camera on the 'mini'. The latter comes with Android 4.1.1 out of the box while the Samsung Galaxy Axiom will have Android 4.0 installed. Lastly, the Galaxy Axiom offers LTE connectivity, something lacking on the Galaxy S III mini. Evleaks says that the Samsung Galaxy Axiom is heading to regional operator U.S.Cellular, which would seem to be a perfect place for a niche device like this. The tweet had no information on expected pricing or availability. Why isn't it Samsung couldn't have made a spec for spec, feature for feature match to the GSIII with a 4 inch screen?! Nice job Sammy, but I can tell they just love the way that galaxy S3 turned out. Axiom you say. I expect a special Wall-E edition. Axiom is a famous mobile retailer in the Middle East sp in UAE!! !